A while back I made the decision to improve my painting skills. 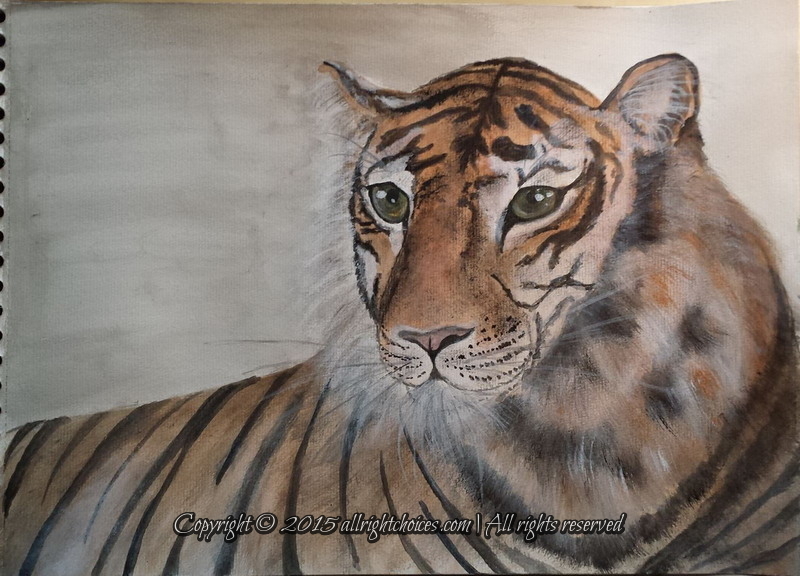 Something I always wanted to learn how to paint better are animals, but fur isn’t easy to replicate with a brush. Doing a bit of research online, I realized what I was doing wrong. When you look at an animal’s coat, you don’t see a single color only. 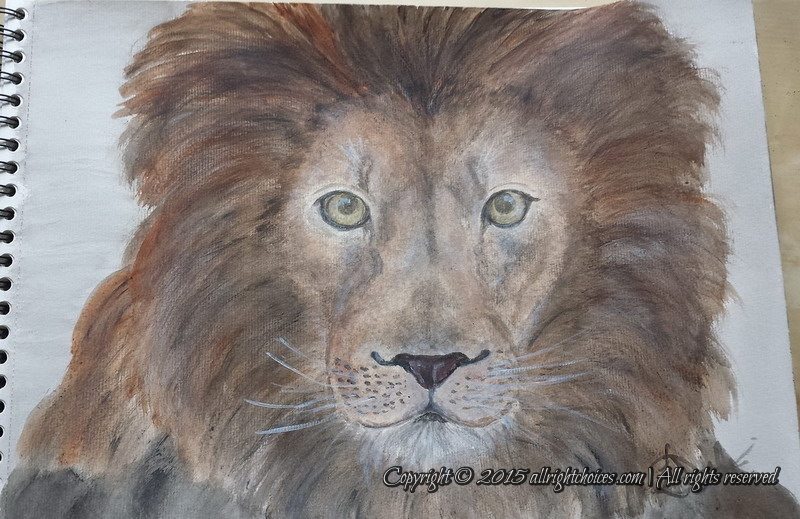 A mix of various shades go in, before the final paint, even if at a first glance, we only see a one color animal. 1. I started with the sketch of the animal, in crayon, drawing the outline and basic shape. 2. 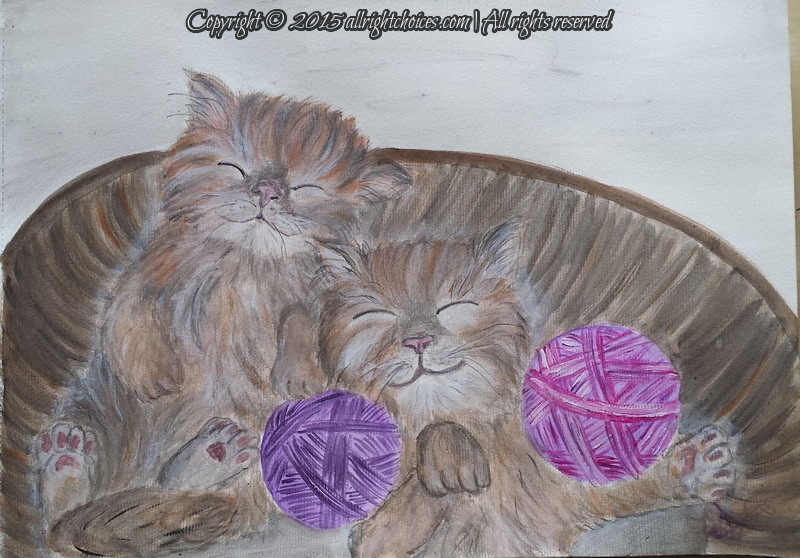 Then I moved on to adding the base color, lighter or darker, depending on the light and also the fur color, by areas. This created depth and made the fur look much more real. Depending on the final color of the animal, I choose as base color, either grey, brown or blue. 3. Moving on to getting the cat closer to its final coat, I started adding hairs, with small movements, using a smaller brush. Later, I gave it a ‘fluffy’ touch with a larger brush. 4. Final steps, highlights. 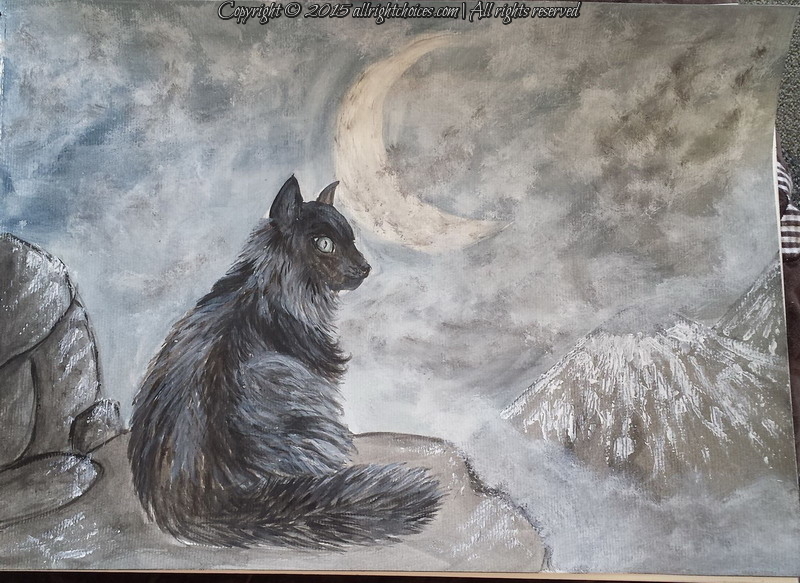 Using a mix of white, black and blue, I added the finishing touches, bringing some shine into the fur, keeping in mind the light on the animal’s coat, especially in the dark background paintings. Started with a brown base color, and a grey background. Gradually added grey, black, white and brown hairs, and finished with white and black accents. 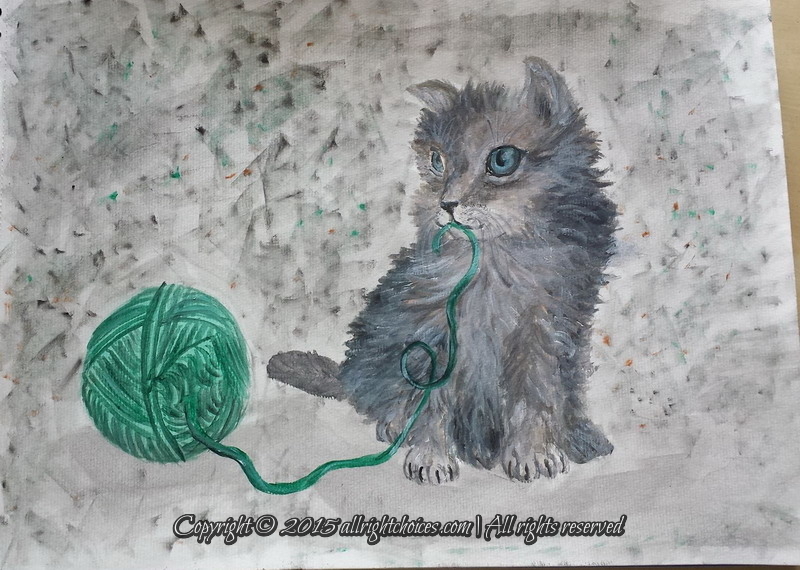 Started with a black and dark blue background, and a dark grey+blue base for the cat. 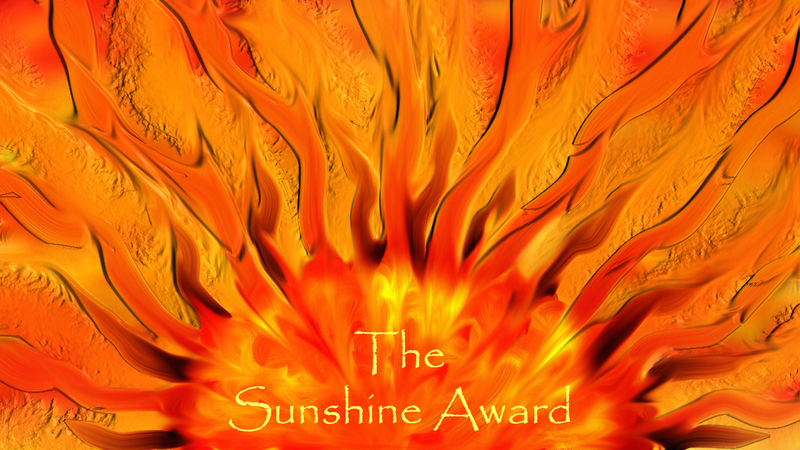 Gradually added lighter grey and white hairs, taking into consideration the shine of the moon, on the cat’s coat. The background clouds are a mix of white and grey, softened with a fluffy brush/sponge. Started with the dark grey background for the wall, and a light grey for the table. 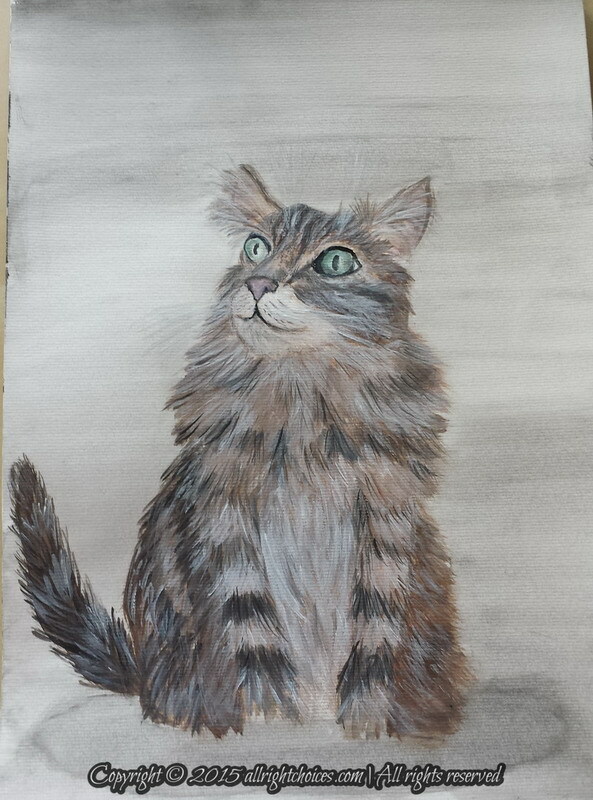 Added a brown (both lighter and darker) base color for the cat, finishing off with black, grey and white hairs. 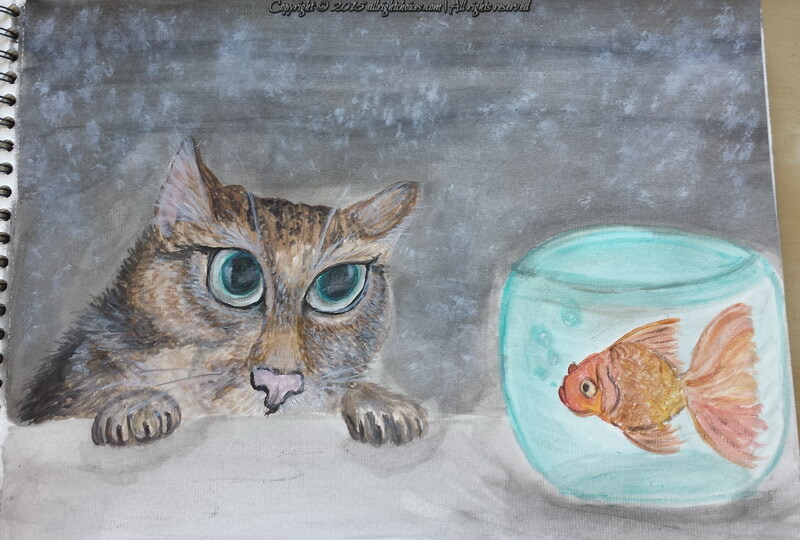 Whiskers were done last, together with the white accents on the wall background, and the fish bowl. Big kitties are also kitties, so why not a lion? To show better the painting technique, I’ve decided to start a video time lapse, for my paintings. I think it turned out pretty good, as I can review all my moves and the entire painting process is easier to follow. 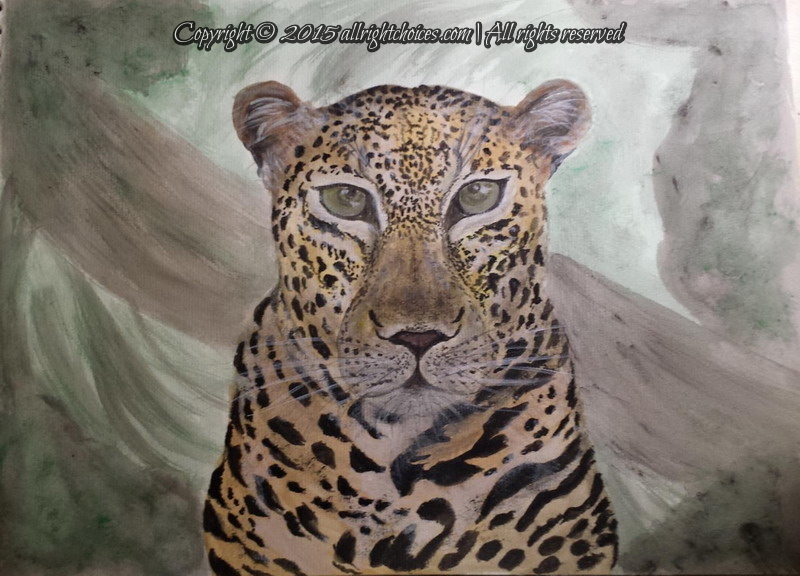 Taking painting to the next level, with another big kitty, a gorgeous leopard. And why not an ever bigger cat, a tiger? 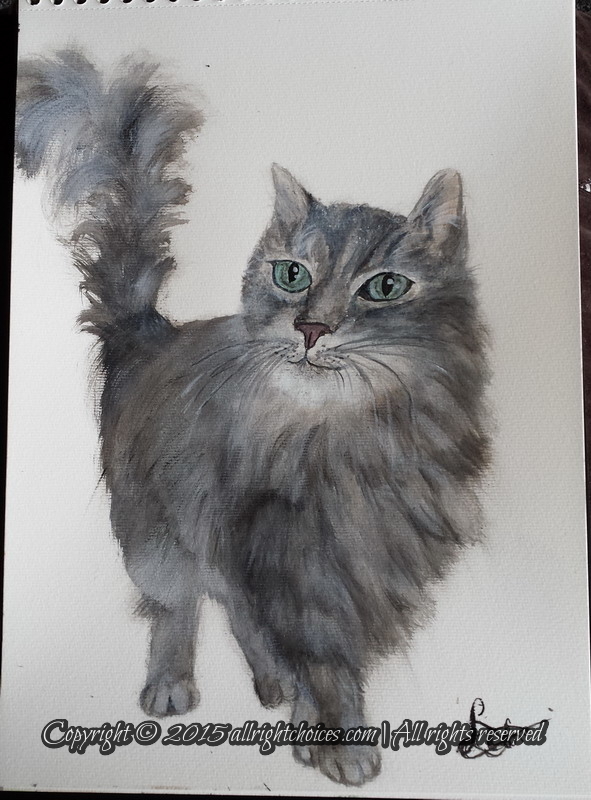 A test kitty, to see if my painting technique improved since the first grey cat painting, from day 1. Definitely mastering much better, the fluffiness in the coat! Painting dogs isn’t that much different from painting cats, so I just had to give it a try. 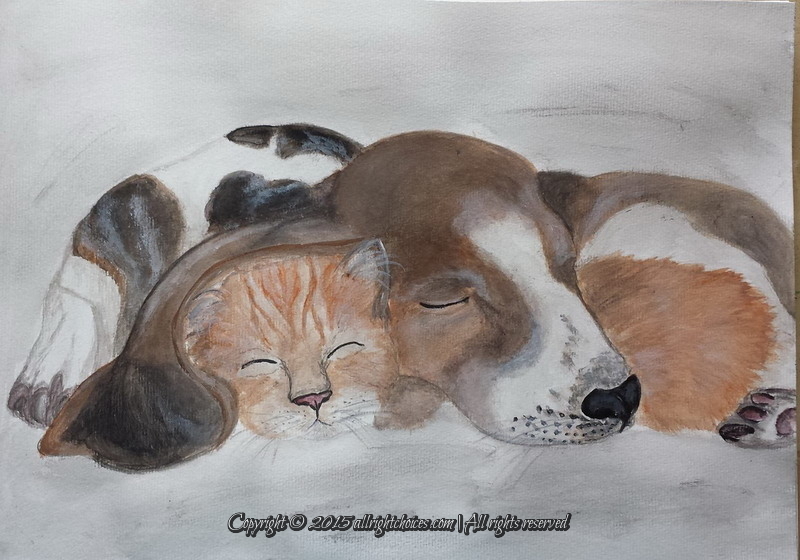 What can be cuter than a basset puppy and a kitten sleeping? 10 big and small cats later (and one puppy), I’m very happy with my progress. My technique improved from one painting to the other. It was all a matter of mastering the right moves and the order of adding the color paint. Looking forward to my next challenge! I’d love to hear your opinion on my progress. Which painting is your favorite?